Government expenditure on public procurement accounts for a sizeable part of economic activity and demand. The annual public-sector procurement budget accounts about 20% to 30% of GDP in the developing countries, which provides the countries public sector with considerable leverage to stimulate the public-sector consumptions favoring goods, works, and services using fewer resources, and less harmful to the environment. The public sector should be more responsible for supporting environmental and broader sustainable development objectives. Green public procurement (GPP) is slowly getting recognized internationally as an effective means for public administrations to manage the balance between cost-effectiveness and sustainable development. The public fund should be used responsibly to uplift the health, environment, and social life. At the same time, the goods, services, and works procured by the government must achieve value for money. 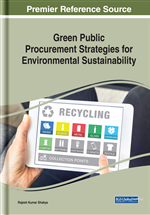 This chapter focuses on the importance of green public procurement strategies that could guide the countries to successfully plan, procure, and implement green public procurement (GPP) by outlining policies, strategies, and actions to boost green public procurement. The recommended strategies are based on the international best practices and the lessons learned from the experience by different government around the world. These strategies could be updated and customized based on the specific country context and their readiness. Different pieces of literature and governments have presented several definitions on the Sustainable Public Procurement (SPP) as well as on the Green Public Procurement (GPP) but primarily focused on the process. A set of such practical definitions are presented here. Sustainable Public Procurement (SPP) is a process whereby organizations meet their needs for goods, services, works and utilities in a way that achieves value for money on a whole life basis for the benefit of society and the economy (Indiana University, 2018), while minimizing damage to the environment. SPP has three pillars, viz. : economic development; social development; and environmental protection (Figure 1). Green public procurement (GPP) is a public procurement, which integrates environmental considerations in the public procurement process and takes into the account the entire lifecycle of the product or service. Also, it is considered to be appropriate and one of the most useful tools seeking to reduce negative impacts on the environment (Shakya, 2016). Moreover, GPP is a process whereby public agencies fulfill their operational needs of goods, works, services, and utilities by soliciting and selecting products and services that have less influence on the environment during their expected economically - useful life, as compared to alternative products/solutions. Prices of the goods, works, and services should consider environmental costs. GPP involves the synthesis of ecological criteria into public procurement processes. In specifying such criteria, procuring entities encourage the promotion of environment-friendly technologies and the development of environmentally sound products. Where possible, public procurement policies should promote the use of all types of environment-friendly products, which allows using energy, water, non-toxic, low emission chemicals. The scale of public procurement offers a powerful policy instrument alongside more traditional instruments such as regulation, policy direction, and economic mechanisms like taxation, to control the market in favor supply of ‘green' goods and services. The aim of establishing Green Public Procurement strategies is to promote GPP and ensure that the purchased goods and services would be as environmentally friendly as possible and help human health better by making our planet green and pollution free for human and other living creatures. Guided by the UN Sustainable Development Goals, countries seem to be mostly trying to align their different policies including the public procurement policy and practice consider the strategies for promoting environmental aspects (green and sustainable public procurement) and adhering to specific social and ethical standards (socially responsible public procurement). Figure 2 shows a systematic steps for the development of green or sustainable green procurement strategies.